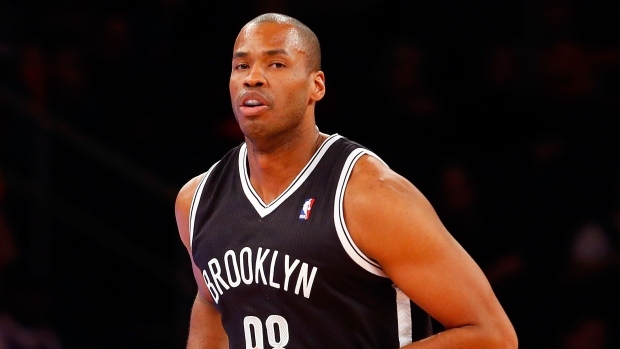 NEW YORK, N.Y. - Jason Collins, the first openly gay player in one of the four major North American professional leagues, announced his retirement Wednesday after 13 years in the NBA. "It's time and I'm very much looking forward to the next steps," Collins said during a press conference Wednesday before the Brooklyn Nets played the Milwaukee Bucks. The 35-year-old Collins disclosed his plans earlier in a first-person story for Sports Illustrated. It's the same forum he used in April, 2013, to publicly reveal his sexuality. He was signed by the Nets in February and played 22 games for the team. Collins said he decided to retire over the summer and had been trying to determine how to make the announcement. He chose Wednesday because he was going to be in New York on business and attending the game to watch his former teammate and coach, Jason Kidd, coach the Bucks. "After last season, especially over the summer, my body was talking to me like it does to all professional athletes after a certain while," Collins said. "It's a young man's game and Father Time is undefeated. Got another one." Nets general manager Billy King congratulated Collins on a "distinguished NBA career" in a statement. "He was an integral part of the back-to-back Eastern Conference Championship teams," King said. "We wish him well as he embarks on a new chapter in his career." Collins graduated from Stanford and was taken in the first round of the 2001 NBA draft, picked 18th overall. He also played for Memphis, Minnesota, Atlanta, Boston and Washington. He averaged 3.6 points and 3.7 rebounds in 20.4 minutes during his career. He thanked Kidd and everyone who supported him over the last 18 months, saying he didn't know what to expect when he decided to come out. Respected for his willingness to do whatever his teams needed, Collins said he hoped to remain around the game. His twin brother, Jarron, is an assistant coach with the Golden State Warriors. "Playing 13 years in the league, people will slap different labels on you," Collins said. "First and foremost, I always want my legacy to be known as a great teammate, someone who always sacrificed for the team." Collins wore No. 98 in his final seasons in the league to honour Matthew Shepard, a gay college student in Wyoming, who was killed in 1998. Collins said his most poignant moment came during his third game back last season, when he met Shepard's family in Denver. "Twin is a role model for a lot of people in this country and throughout the world," Kidd said. "To have him around last year, as a person but he knew how to play basketball. He wasn't one that could jump and touch the top of the backboard, but he knew how to be a true pro." Following Collins' revelation, Missouri defensive end Michael Sam came out in February and was drafted by the NFL's St. Louis Rams. He was later cut by the Rams and released from the Dallas Cowboys practice squad last month. In April, University of Massachusetts guard Derrick Gordon became the first openly gay player in Division I men's basketball. Billie Jean King called Collins "an influencer on and off the basketball court" in a statement to The Associated Press. Collins thanked the former tennis great for her support when he first came out. "I hope his decision to live his truth and do so on his own terms will inspire him on the next phase of his journey," King said. Collins was in meetings Wednesday with King's leadership organization and intends to stay active with that and similar groups and charitable organizations. "This is something that I will continue to do," Collins said, "speak out and push for people to live their authentic life, continue to speak out for diversity and inclusion." AP Sports Writers Brian Mahoney in New York and Pat Eaton-Robb in Hartford, Connecticut, contributed to this report.